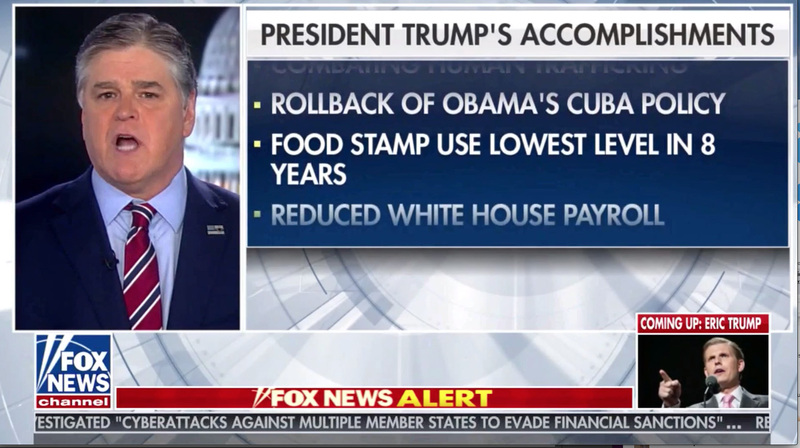 Hannity instantly began heaping on the praise of Donald Trump, calling the speech “one single most inspiring challenges to the country” and a “unprecedented” list of accomplishments. That list would appear a bit later in the show in graphical format — scrolling next to Hannity in a movie-style scroll. The list itself could probably keep fact checkers busy for hours, but there are some immediate discrepancies or misleading parts of it. One odd claim of simply “Rise to a 7-year high,” which, despite having its own bullet point, appeared to be orphaned from the line above it referencing to the number of applications for mortgages for new homes. Some other items on the list were a bit vague — “independence and economic growth” and “fixing the Department of Veterans affairs.” The scroll also claimed the “lowest use of food stamps in 8 years,” which fails to point out the number on SNAP benefits has been falling for years and has been significantly lower than it is even now. The words “Signed trade deal with China” were just appearing on the scroll when the network abruptly cut to video of earlier in the night from inside the Capitol.